This tutorial is part one of a series. 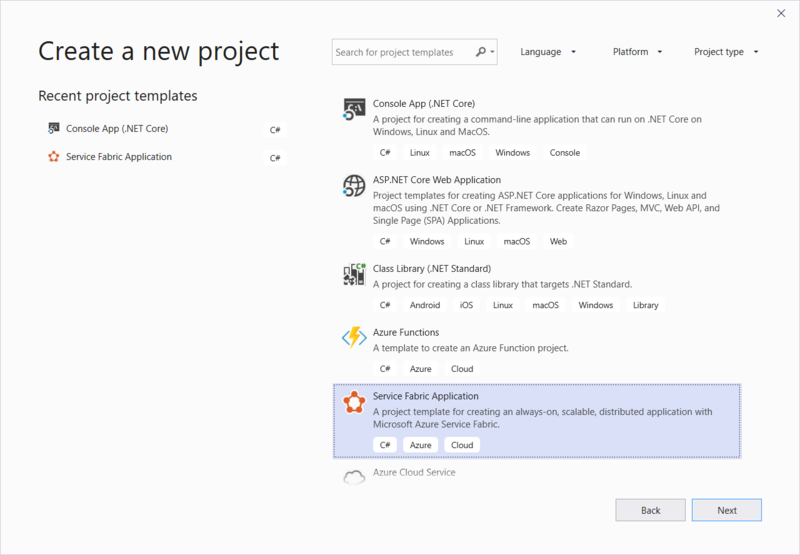 You will learn how to create an Azure Service Fabric application with an ASP.NET Core Web API front end and a stateful back-end service to store your data. When you're finished, you have a voting application with an ASP.NET Core web front-end that saves voting results in a stateful back-end service in the cluster. If you don't want to manually create the voting application, you can download the source code for the completed application and skip ahead to Walk through the voting sample application. If you prefer, you can also watch a video walk-through of this tutorial. Install Visual Studio 2017 version 15.5 or later with the Azure development and ASP.NET and web development workloads. First, create the web front-end of the voting application using ASP.NET Core. 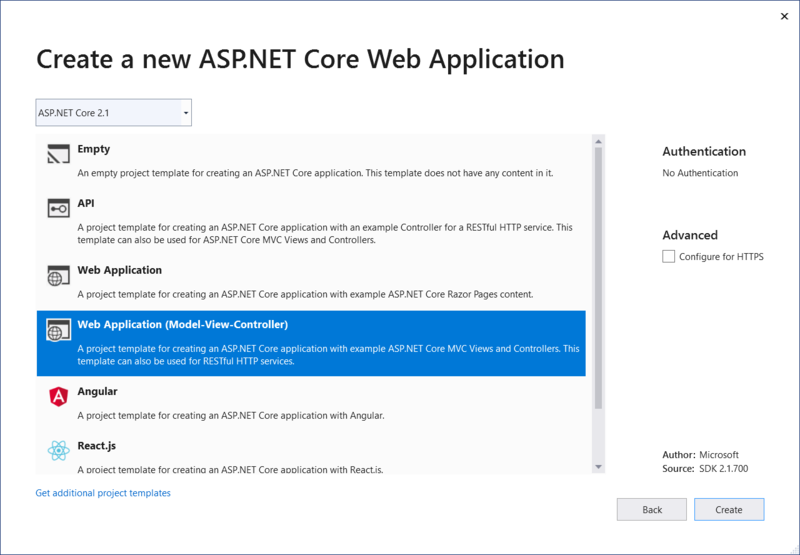 ASP.NET Core is a lightweight, cross-platform web development framework that you can use to create modern web UI and web APIs. 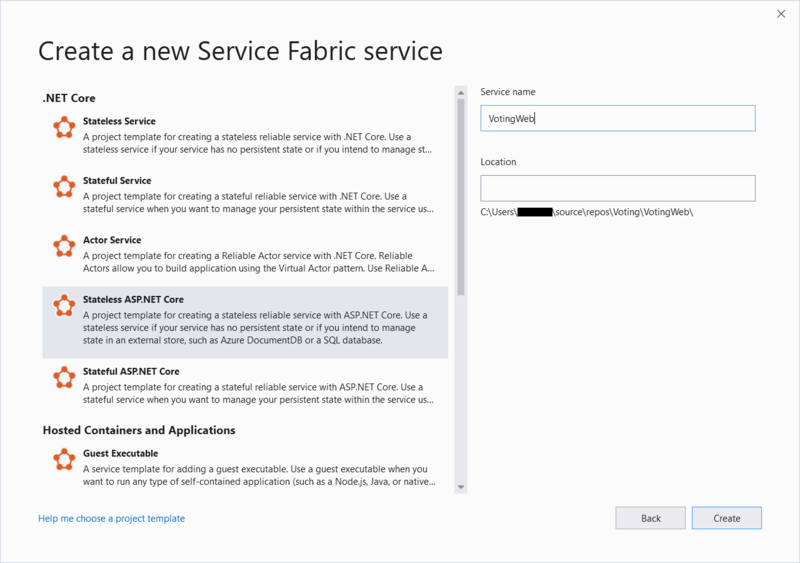 To get a complete understanding of how ASP.NET Core integrates with Service Fabric, we strongly recommend reading through the ASP.NET Core in Service Fabric Reliable Services article. For now, you can follow this tutorial to get started quickly. To learn more about ASP.NET Core, see the ASP.NET Core Documentation. Create a project with File->New->Project. In the New Project dialog, choose Cloud > Service Fabric Application. Name the application Voting and click OK.
On the New Service Fabric Service page, choose Stateless ASP.NET Core, name your service VotingWeb, then click OK. The next page provides a set of ASP.NET Core project templates. For this tutorial, choose Web Application (Model-View-Controller), then click OK. Visual Studio creates an application and a service project and displays them in Solution Explorer. Open Views/Home/Index.cshtml, the view specific to the Home controller. Replace its contents with the following, then save your changes. Open Views/Shared/_Layout.cshtml, the default layout for the ASP.NET app. Replace its contents with the following, then save your changes. Open the VotingWeb.cs file, which creates the ASP.NET Core WebHost inside the stateless service using the WebListener web server. Add the using System.Net.Http; directive to the top of the file. Replace the CreateServiceInstanceListeners() function with the following code, then save your changes. Also add the following GetVotingDataServiceName method below CreateServiceInstanceListeners(), then save your changes. GetVotingDataServiceName returns the service name when polled. Add a controller, which defines voting actions. Right-click on the Controllers folder, then select Add->New item->Visual C#->ASP.NET Core->Class. Name the file VotesController.cs, then click Add. Replace the VotesController.cs file contents with the following, then save your changes. Later, in Update the VotesController.cs file, this file is modified to read and write voting data from the back-end service. For now, the controller returns static string data to the view. When the VotingWeb front-end service is created, Visual Studio randomly selects a port for the service to listen on. The VotingWeb service acts as the front-end for this application and accepts external traffic, so let's bind that service to a fixed and well-know port. The service manifest declares the service endpoints. In Solution Explorer, open VotingWeb/PackageRoot/ServiceManifest.xml. Find the Endpoint element in the Resources section and change the Port value to 8080. To deploy and run the application locally, the application listening port must be open and available on your computer. Also update the Application URL property value in the Voting project so a web browser opens to the correct port when you debug your application. In Solution Explorer, select the Voting project and update the Application URL property to 8080. You can now go ahead and run the Voting application for debugging. In Visual Studio, press F5 to deploy the application to your local Service Fabric cluster in debug mode. The application will fail if you didn't previously open Visual Studio as administrator. The first time you run and deploy the application locally, Visual Studio creates a local Service Fabric cluster for debugging. Cluster creation may take some time. The cluster creation status is displayed in the Visual Studio output window. To stop debugging the application, go back to Visual Studio and press Shift+F5. Now that an ASP.NET Web API service is running in the application, go ahead and add a stateful reliable service to store some data in the application. Service Fabric allows you to consistently and reliably store your data right inside your service by using reliable collections. Reliable collections are a set of highly available and reliable collection classes that are familiar to anyone who has used C# collections. In this tutorial, you create a service which stores a counter value in a reliable collection. 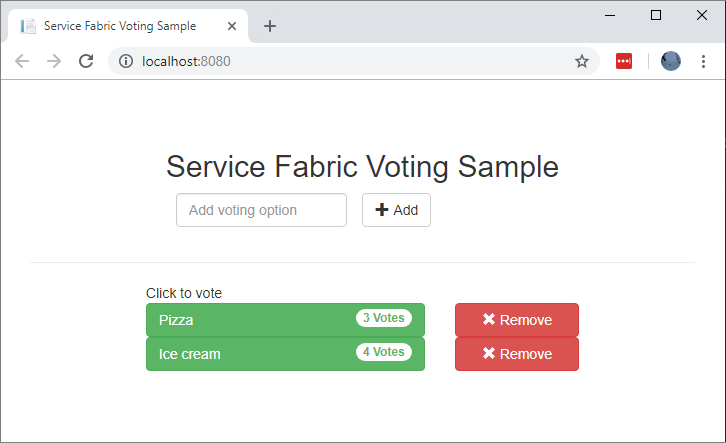 In the New Service Fabric Service dialog, choose Stateful ASP.NET Core, name the service VotingData, then press OK.
Once your service project is created, you have two services in your application. As you continue to build your application, you can add more services in the same way. Each can be independently versioned and upgraded. The next page provides a set of ASP.NET Core project templates. For this tutorial, choose API. 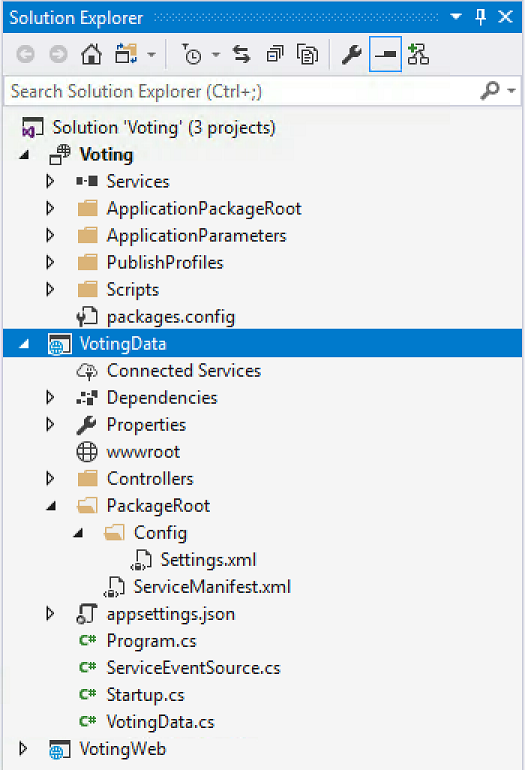 Visual Studio creates the VotingData service project and displays it in Solution Explorer. In the VotingData project, right-click on the Controllers folder, then select Add->New item->Class. Name the file VoteDataController.cs and click Add. Replace the file contents with the following, then save your changes. In this next step, connect the two services and make the front-end Web application get and set voting information from the back-end service. Service Fabric provides complete flexibility in how you communicate with reliable services. Within a single application, you might have services that are accessible via TCP. Other services that might be accessible via an HTTP REST API and still other services could be accessible via web sockets. For background on the options available and the tradeoffs involved, see Communicating with services. Open a browser window and navigate to http://localhost:19080 to open the Service Fabric Explorer tool. Make a note of the HttpApplicationGatewayEndpoint element port. By default this should be 19081. If it is not 19081, you will need to change the port in the GetProxyAddress method of the following VotesController.cs code. In the VotingWeb project, open the Controllers/VotesController.cs file. Replace the VotesController class definition contents with the following, then save your changes. If the reverse proxy port you discovered in the pervious step is not 19081, change the port used in the GetProxyAddress method from 19081 to the port that you discovered. /// Constructs a reverse proxy URL for a given service. /// Creates a partition key from the given name. /// Uses the zero-based numeric position in the alphabet of the first letter of the name (0-25). Web front-end service (VotingWeb)- An ASP.NET Core web front-end service, which serves the web page and exposes web APIs to communicate with the backend service. Back-end service (VotingData)- An ASP.NET Core web service, which exposes an API to store the vote results in a reliable dictionary persisted on disk. The web front-end service uses a proxy to locate and forward an HTTP PUT request to the back-end service. The back-end service takes the incoming request, and stores the updated result in a reliable dictionary, which gets replicated to multiple nodes within the cluster and persisted on disk. All the application's data is stored in the cluster, so no database is needed. When debugging application in Visual Studio, you are using a local Service Fabric development cluster. You have the option to adjust your debugging experience to your scenario. In this application, store data in the back-end service using a reliable dictionary. Visual Studio removes the application per default when you stop the debugger. Removing the application causes the data in the back-end service to also be removed. To persist the data between debugging sessions, you can change the Application Debug Mode as a property on the Voting project in Visual Studio. 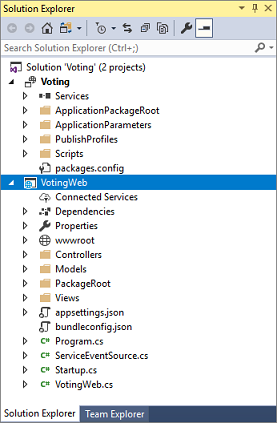 Open the VotingWeb\VotesController.cs file and set a breakpoint in the web API's Put method (line 72). Open the VotingData\VoteDataController.cs file and set a breakpoint in this web API's Put method (line 54). Press F5 to start the application in debug mode. Go back to the browser and click a voting option or add a new voting option. You hit the first breakpoint in the web front-end's api controller. First construct the URL to the ReverseProxy for the back-end service (1). Then send the HTTP PUT Request to the ReverseProxy (2). Finally the return the response from the back-end service to the client (3). You are now at the break point in the back-end service. In the first line in the method (1) use the StateManager to get or add a reliable dictionary called counts. All interactions with values in a reliable dictionary require a transaction, this using statement (2) creates that transaction. In the transaction, update the value of the relevant key for the voting option and commits the operation (3). Once the commit method returns, the data is updated in the dictionary and replicated to other nodes in the cluster. The data is now safely stored in the cluster, and the back-end service can fail over to other nodes, still having the data available. To stop the debugging session, press Shift+F5.